Switzerland is famous for cheese, chocolate, and wine, and this full-day tour from Chamonix will introduce you to all three. Sample decadent chocolates on a tour of the Cailler Chocolate Factory; visit Gruyères village, famous for its eponymous cheese; and explore the UNESCO-listed Lavaux vineyards, overlooking Lake Geneva. After an around 2–hour drive, arrive in Broc, where you’ll enjoy a guided tour of the Cailler Chocolate Factory. Uncover the secrets of Swiss chocolate as you explore the factory, then indulge your sweet tooth as you sample a selection of delicious chocolates. 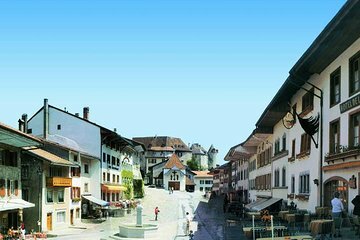 Continue to the alpine village of Gruyères and experience the atmosphere of a traditional Swiss village. Perhaps browse the souvenir shops, enjoy a typical Swiss lunch (own expense), or sample some of the village’s famous Gruyère cheese. On the way back to Chamonix, stop by the Lavaux Vineyards, a UNESCO World Heritage site overlooking Lake Geneva, where you’ll discover Switzerland’s long winemaking heritage. After a full day in Switzerland, your tour ends back at Chamonix bus station around 7.30pm.